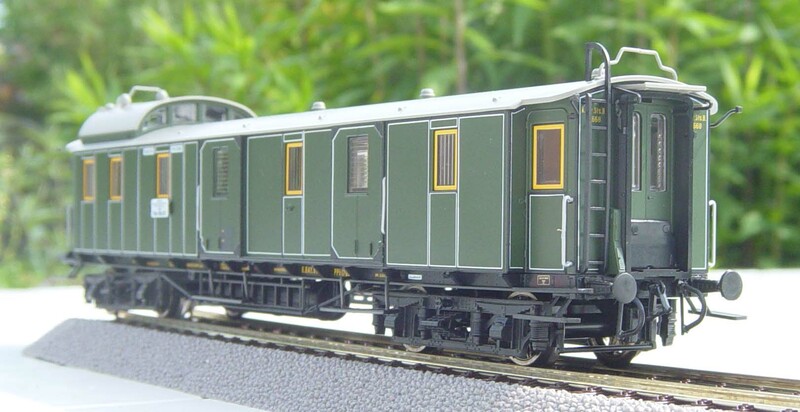 In 2004 the Austrian firm Roco announced a series of Bavarian four axled coaches including a luggage wagon. It belongs to the first series called Platinum which stands for fine quality and rich detail. You might be interested in Roco Platinum Package. Although it took a year to release it, it was certainly worth waiting for. May 2005 I received this Päckwagen in rein Bayerischer Bauart. 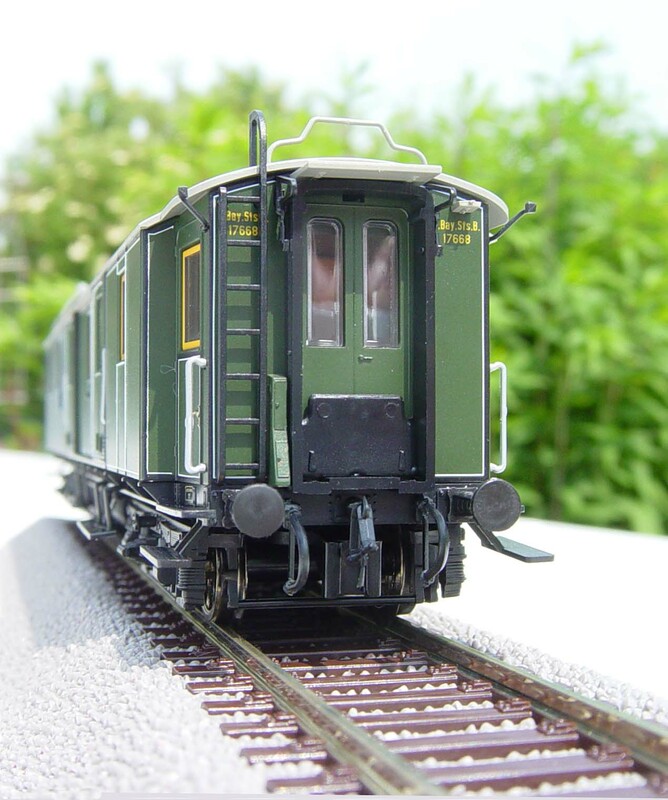 In comparison with the Märklin model (1996), you can almost feel the difference between platinum and plastic. 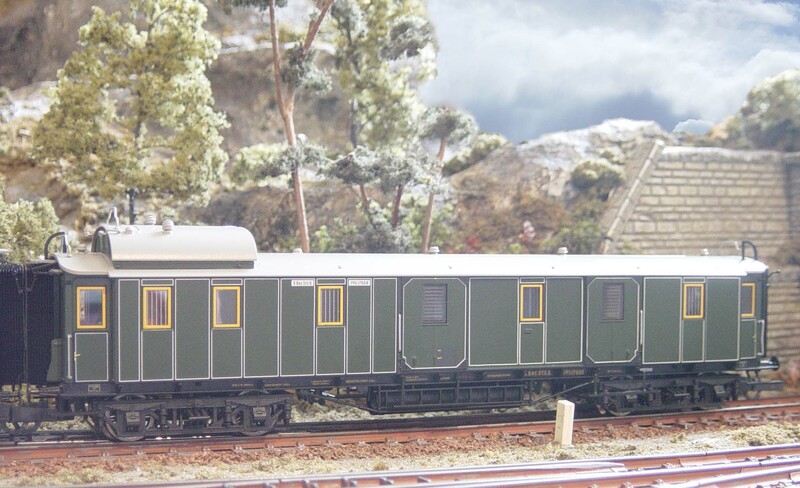 The 3 handrails on the roof give this model a specific 'Bavarian' look. Let your eyes wander across and around this model and discover the many, separately attached, details. ...for running on R 360 tracks, the footsteps had to be cut open. The underside of the wagon shows more details: adjustable couplers, brake installation, gas cylinders etcetera. Every coach comes with closed “Faltenbugel”. Compare this image to the one below. I had to change the 'Faltenbügel', adjust the braking hoses and add an imitation coupler. This is how it looks after revision. Unfortunately, although I was very careful, I did break the handgrip on the roof. Looking for authenticity, this model approaches reality pretty close. or on the Cochemer Bahn.